The Kansas City IT Symposium is Kansas City's premier single-day event designed for the local IT executive community. By registering today you will gain the opportunity to network with over 500 local IT executives representing 140 companies. 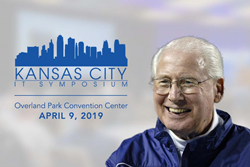 The Kansas City IT Symposium is returning to the Overland Park Convention Center on April 9, 2019. The Symposium continuously brings together over 500 local IT leaders representing 140+ companies. The partnering sponsors of the Symposium are able to get quality face to face time with each of these attendees making their day not only progressive but efficient. This year's event includes hard-hitting keynote speakers like recently added, Bill Snyder. In 1989, Snyder took over the worst program in all of college football and turned the Wildcats into a top-10 team within just seven seasons. The Hall-of-Fame coach led K-State to more than 200 wins, 18 bowl games, nine seasons with 10 or more wins, six Top-10 finishes, and two Big 12 championships. His closing keynote presentation will talk about the 16 goals to success that Bill believes can help anyone be successful in both your personal and business life. Along with 3 keynote presentations there will be 28 practitioner-lead breakout sessions throughout the day. Sponsoring vendors and attendees will gain unlimited access to all of the activities throughout the Symposium day. Sponsoring vendors have the opportunity to share information about problem-solving technology and ideas local executives can use in their day-to-day business practices. Most sponsors use this opportunity to present themselves as experts who can be utilized to help with the issues that present themselves in the workplace. Vendors will also be recognized as an organization committed to supporting and helping grow the region's IT industry. To find out more about the Kansas City IT Symposium please contact Gary Peyton at gary(at)kcitsymposium(dot)com or visit the event website.